Local Cleaners Crystal Palace is a reliable cleaning company that offers top-to-bottom cleaning services to London residents. Local Cleaners Crystal Palace has been your local provider of quality domestic cleaning services for many years now. We have always valued our customers more than anything else and you can rely on us at any time – we are available on weekends and in emergencies. Whether you book us to remove your rubbish or to clean your oven, we will always work hard to deliver results beyond your satisfaction. First get in touch with us and tell us your needs, then you can go to Crystal Palace Triangle and visit a restaurant or do some shopping. The trained cleaners will be done with their work by the time you are back home, saving you both time and money! We can remove oily stains, coffee, wine, tea spots, and more! The cleaners come ready for work – they carry professional detergents that won’t harm the fabric. We have 3 rug cleaning methods: hot water extraction, dry cleaning, and steam cleaning. Book us to professionally clean your oven. We will scrub it, pay special attention to its removable parts, clean the glass and, when we’re done, your food will taste better than ever. Our services prolong the life of your oven and make it more energy efficient. Once the cleaners arrive, they will use a thorough checklist to clean every room in your property. Of course, you can tell them in which areas to perform dusting and wiping first. We use pet and child-safe cleaning solutions. If you are a tenant who is moving out – call us to clean your rented home to perfection so you can have your full bond back. If you are a landlord – you can count on us to enhance the appeal of your place. We arrive, collect your waste, and then transport it to the closest dumpster so that your house is clean once again. We can take care of household, office, and even construction waste. We use an innovative machine – a water-fed pole – to clean from the ground up to 22 metres high. No detergents are used – only purified water. This service is far quicker than the regular ladder method. You will no longer have to use ladders to climb on your roof and clean your gutters. We will perform thorough hoovering of your drainage system from the ground with a professional gutter vacuum machine. Our equipment comes with a tiny camera that will allow you to see before/after photos, too! Let us take care of your home! We love helping you, regardless of how big or difficult the task is. 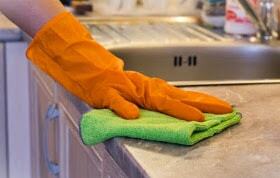 What Makes Our Cleaning Services so Convenient? Depend on us at all times as our customer support is available 24/7 and we also work during the weekends. Call us at 020 3746 8292 and our representatives will kindly tell you everything you need to know in order to make an appointment. If your schedule is too busy, why not send us an e-mail instead? You will get a response shortly after that. And if you wish to talk to us while browsing our services instead, just use the instant chat on our website. Booking a cleaner in SE19 has never been easier!